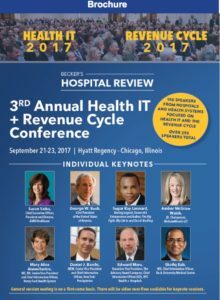 If you’re going to the Becker’s Hospital Review 3rd Annual Health IT + Revenue Cycle Conference next week in Chicago, better brush up on the top industry topics. Check out Becker’s Hospital Review list of 25 things to know about revenue cycle management. The article was written in January, but still highly useful as it’s interesting to see if their summary about 2016 is continuing into 2017. It’s our first Becker’s conference, so I’m going in open-minded and excited about what we are about to hear, particularly on the topics involving healthcare payments and reimbursements trends.